Texas’ only radioactive waste dump wants to open its gates to tens of thousands of metric tons of spent nuclear reactor fuel now scattered across the country – a large expansion it is pitching as a temporary solution for a problem that has bedeviled federal policymakers for decades. 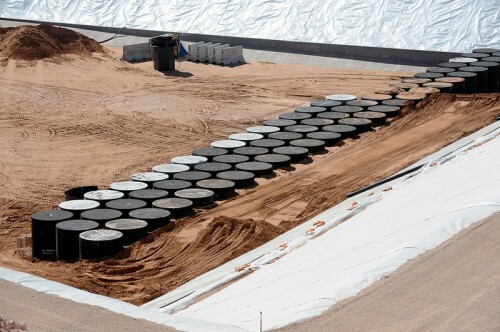 Waste Control Specialists is seeking federal approval to temporarily store highly radioactive waste at its complex in Andrews County, northwest of Midland. In a letter sent Friday to the U.S. Nuclear Regulatory Commission, the company, formerly owned by the late Dallas billionaire Harold Simmons, said it plans to file a federal license application in early 2016. The sprawling facility is one of few in the country that accepts low-level nuclear waste, and it has been growing. Since 2012, the company has used less than 10 percent of its 1,400-acre site to store contaminated tools, building materials and protective clothing, among other items, from shuttered reactors and hospitals. And last year, it took in 420 truckloads of transuranic waste from the federal government’s nuclear weapons program. If the federal government will let it, the company said it would initially set aside about 1,000 acres for spent fuel currently stored at Texas’ four operating nuclear reactors – at Comanche Peak in Glen Rose and the South Texas Project outside of Bay City – and shuttered reactors elsewhere. The plans call for the facility to hold the fuel for 40 years or longer if necessary. The company would later consider making room for waste generated by the country’s other 95 operating reactors, it said. It expects to get its license by summer of 2019 and accept used fuel by the next year. Last month, the commissioners court of Andrews County adopted a resolution supporting the expansion. The county currently receives 5 percent of the facility’s gross receipts – totaling about $5 million in direct payments. The state gets 25 percent of the receipts, and the Legislature may eventually want to weigh in on the plan. Environmental groups have closely scrutinized the company as it has expanded the scale of the waste it accepts, with some opposing the idea of housing such waste anywhere in Texas. “It’s all risk and no reward for Texas,” said Tom “Smitty” Smith, director of Public Citizen’s Texas office. Among other concerns, the group fears that transporting the waste could prove dangerous, and that Andrews County would become a de facto long-term storage site if Congress fails to find a better option. Washington has long sought a final resting place for the roughly 70,000 metric tons and counting of spent nuclear fuel and other highly radioactive materials that have accumulated at nuclear reactor sites and other storage facilities across the country. In 2012, the Blue Ribbon Commission on America’s Nuclear Future, assembled by President Obama, suggested that policymakers develop at least one geologic disposal facility and at least one consolidated storage site — the type Waste Control Specialists is pitching — to remove the burden from nuclear generators. Last year, House Speaker Joe Straus, R-San Antonio, instructed lawmakers to study the economic potential of storing highly radioactive nuclear waste in Texas. “I think putting one of these facilities in Texas is a good idea, as long as the community and its leaders, including city council and county commissioners, welcome it,” the statement said. Under its proposal, the West Texas site would use the same dry-cask method used elsewhere to store the waste aboveground. “It’s row upon row of dry cask,” Baltzer said. Smith said his biggest concerns surrounded how to transport all the waste to Andrews County, and whether the trucks or trains carrying the waste would become targets for terrorists. In a report last March, the Texas Commission on Environmental Quality acknowledged that transportation of the fuel to one site “will be a complex logistical project” that could take 10 years to arrange and about 20 years to carry out. The federal Department of Energy says such a project could require 10,700 rail shipments or 53,000 truckloads. From 1970 to 2010, more than 3,000 shipments of spent nuclear fuel traveled more than 1.7 million miles across the country, the TCEQ report said. That yielded nine accidents, with five involving radioactive material. None of that material spilled. Dale Klein, associate director of the University of Texas Energy Institute and the former chairman of the U.S. Nuclear Regulatory Commission, said he believes the fuel could be transported and stored safely at a centralized facility, and the biggest safety challenge would be educating the public. This entry was posted in KRTS News and tagged Andrews, Andrews County, Energy, Environment, Los Alamos National Lab, Nuclear Power, Permian Basin, Radioactive Waste, Texas Tribune, Waste Control Specialists, West Texas Nuclear Site. Bookmark the permalink.